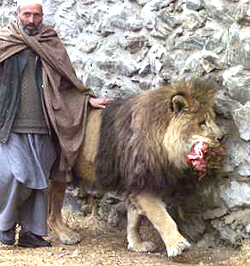 I recently found this link to a video of Marjan, The Lion of Kabul. 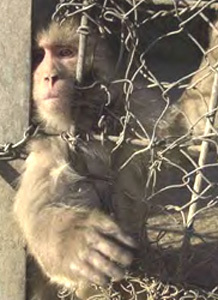 Marjan and the Kabul Zoo are only one of my many heartbreaking stories. If you don't know of Marjan or the horrors of the Kabul Zoo, please learn. Although Marjan may be forgotten, the cruelty continues. Farewell Marjan - we will never forget you. After watching the video, please scroll down this page to read Marjan's Story. "The big problem with our country is that no one knows what to do with animals. The war has damaged their minds," he says, passing by an open pen for macaques, surrounded by a moat of filthy water filled with trash. "They stand here and throw stones, shoes, and even their hats at the animals. They fight with the animals, they don't come to just see the animals." following an extensive examination by Dr John Lewis from the International Zoo Veterinary Group. 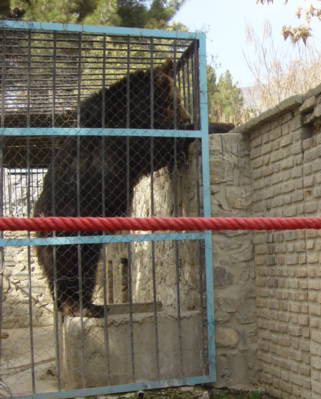 The decision was taken in discussion with the Zoo Director and the Director of Culture for the Municipality of Kabul. The examination of Donatella was undertaken with the Veterinary Officer and Curator of Kabul Zoo. Donatella had been under treatment for long periods during the two years after her condition was first identified. to her nose and the associated spread and deterioration from there. No treatment proved to be effective and over the years a general deterioration has been seen. to the central nervous system and as a result her quality of life would deteriorate further. The initial post-mortem examination proved that the decision to euthanize Donatella (at long last) was correct. "Thought you'd like some other shots. Sorry I don't have any more info for you on the animals". "I thought you would be interested in the latest info and photos from Kabul Zoo". I'm sorry to say that with these links came no new information on the zoo. No new information on Donatella, not even the names of some of the animals. "The animals we are treating are absolutely critical to these people's survival," he said. They having nothing but their horse to rely on and if you take that away, they'll be left with nothing at all. In that respect, this is one of the most important ways of helping the people who have become the victims of this war." Sambu/Donatella the bear continues to improve but slowly. and the veterinarians have assured us that the infection is steadily getting better. On days when she does not cooperate, the veterinarians must carefully weigh the risks of skipping a day of medications against the risks of anesthetizing her to apply the medication. to make it easier to capture her on a daily basis. Keepers and veterinary staff remain concerned about an infection in the bear Sambu's nose and mouth. At present, a German military veterinary team is treating the bear and will be visiting her daily to oversea her treatment. She is being monitored carefully to determine if she needs additional or alternate treatments. If these are needed, steps will be taken to provide whatever care she needs. 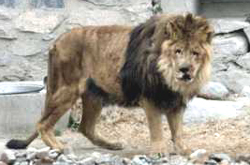 Sambu's health ranks as a major concern to all of the people who are working to help the Kabul Zoo. The Zoo Society wants to assure the many donors to this project that Sambu is receiving the best care possible and that everything that can be done to help her recover will be done. Dr. John Lewis undertook and successfully completed minor surgery on Donatella the bear, April 10, 2002. He treated the nose and mouth topically and took deep biopsies for examination in the UK. The procedure went very well and the recovery was good. has now taken over the funding, and other responsibilities of the Kabul Zoo, however, WSPA will be in contact continuously while the AZA is there. Two wildlife personnel and one British veterinarian are there now inspecting and giving aid to the zoo. They will be assessing the needs of the zoo, the animals, their diet, enrichment materials, etc. Donatella ("Samboo") is doing fairly well. She was moved to a spacious enclosed when WSPA was there in February 2002.
in order to determine a better treatment (antibiotic) for faster healing. and companion animals who are suffering there. Donatella was moved to a very large enclosure. Enrichment materials (a pool to swim in, trees, bushes, and some toys) have been placed in her new enclosure. Her nose is healing, however slowly. The AZA (see below) will be checking in on her condition in the coming months. 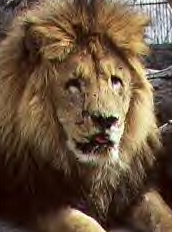 The AZA will be taking over the responsibility of the disaster relief efforts for the Kabul Zoo from here on in. for example livestock, working animals, and stray animals. who are treating thousands of refugee horses coming into Pakistan from Afghanistan. Dallas Morning News staff photographer Damon Winter spent a month covering the war in Afghanistan. 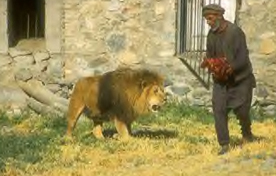 In that time, he came to know the residents of the Kabul Zoo -- including one special feline. 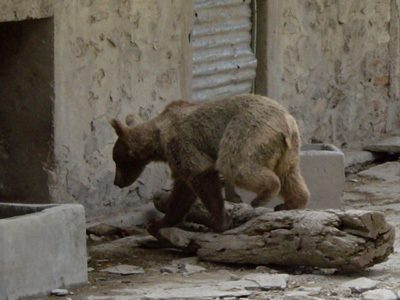 In this piece, he reflects on the conditions of the Kabul Zoo. February 13, 2002 � Following are highlights from the press conference held at the North Carolina Zoo in Asheboro, today (Feb. 13) and featuring John Walsh, International Projects Director for the World Society for the Protection of Animals (WSPA), discussing his experiences at the Kabul Zoo. During the press conference, Walsh discussed the present condition of the Kabul Zoo, the immediate objectives concerning aid to and construction at the zoo and long-range plans for the Kabul Zoo and other Afghan animals. A WSPA emergency relief team spent three weeks in Afghanistan helping animals recover from years of civil war and economic chaos. Jonathan Pearce reports on what they achieved. 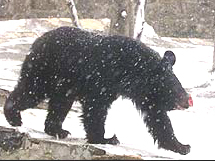 Donatella, an Afghanistan Asiatic Black bear, frolics in the snow nursing a nose wound, after being transferred to a more spacious habitat within the zoo's compound in Kabul, Afghanistan Friday Feb. 1, 2002. Donatella, the biggest animal in the badly battered zoo, has moved to a larger area, part of which used to be the space for Marjan. The Zoo is being rehabilitated following the fall of Kabul late last year. The Brooke Hospital for Animals is committed to alleviating the suffering of working equines worldwide by providing a free veterinary service and by helping their owners to prevent disease and debilitation through education. Terribly overloaded, this little donkey is struggling to keep his feet on the ground. It seems terribly sad that Marjan died at this particular time, but he lived to see better times, to eat well, to be warm, to meet people who cared, to have some of his pain relieved. Had he lived any longer, he would have still been confined, teased, tormented, crippled, in danger, unable to see and without his mate. Marjan died in his sleep, perhaps dreaming of his beloved mate, Quanni*. Marjan's name refers to a precious stone beloved by Afghans, that I believe to be Coral. *Marjan's mate's name was either Chucha or Quanni. She died of untreated illnesses in 1999. It would be an insult to Marjan and all captive animals to replace him. People from all walks of life and nationalities came Sunday to the battle-scarred Kabul Zoo to pay homage to Marjan, the one-eyed lion who came to symbolize this nation's determination and endurance amid years of suffering. Malnourished and barely able to walk, Marjan succumbed on Saturday to likely kidney and liver failure. His age was undetermined but he was believed to be in his late 20s. On Sunday, militiamen with Kalashnikovs slung on their shoulders saluted him. Mothers lifted their powder-blue veils for a peek into his cage. Children who used to tease him cried. Foreign envoys offered condolences to zookeepers. Journalists from London tabloids, People magazine, world news wires and major TV outlets sought details to craft his obituary. "He's finally at peace now," said Johnathan Pearce, one of several international relief workers who arrived this month to rehabilitate the zoo's sick and shell-shocked animals. In the end, Marjan had endured 23 years of starvation, bombings and beatings, and the brutal rule of the Taliban. Only recently had veterinarians arrived to help him fight colon inflammation and infections caused by years of vitamin deprivation. 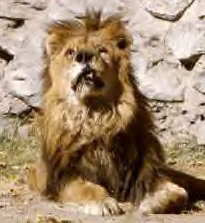 With a golden mane and scraggly beard, Marjan's conflict-weary face was on fundraising placards and ads distributed by zoo societies from Australia to America. He first gained international notice in 1995 after a British television crew filmed the plight of the zoo's animals. When Walsh arrived two weeks ago, he found Marjan to be totally blind, arthritic, dehydrated and undernourished. Longtime Afghan caretakers said Marjan has been severely depressed and grumpy since his mate Chucha* died of natural causes two years ago. 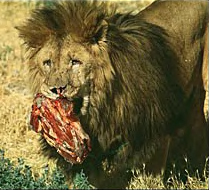 Walsh changed the lion's diet by varying the kinds of meats to boost his immune system. He injected Marjan with vitamin supplements, heated his sleeping den, and installed a mat to keep him off the concrete floor. It was a regal life compared to the cold winters Marjan spent without warmth for most of his life. At first, Marjan seemed uplifted. But in the last week, his health deteriorated. On Wednesday he was no longer able to eat. On Friday evening, workers again carried him into his den, where he was found dead, in the same position, the next morning. On Sunday, Afghan zookeepers dug a vault-sized grave not far from where Marjan's mate is buried. Farewell Marjan - we will never forget you! Marjan the lion was buried Monday at the Kabul Zoo, where he suffered the torments of war and won countless hearts worldwide. 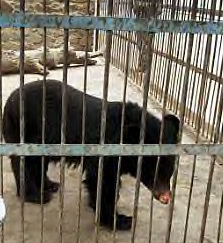 He was found dead in his cage Saturday morning, a few weeks after his story attracted international attention. With one eye lost to a grenade attack, lame and weakened by war's deprivations, Marjan became a powerful symbol of Afghanistan's sufferings and his dignified bearing seemed to speak of the country's determination to rise above misery and fear. An aid effort led by the World Society for the Protection of Animals raised funds for Marjan and the other animals in the zoo, which fell into dismal neglect during 23 years of war. Despite the WSPA's efforts to improve his diet and ease his life with heat in his cage and a padded sleeping area, Marjan had only a few weeks to enjoy in his sudden reversal of fortune. In his last days, he had to be carried from his sleeping area to a spot where he could lie in the sun. Eventually his kidneys and liver apparently gave out, said the WSPA's John Marsh. Marsh said he found Marjan such an evocative symbol that he wants to see a statue built in his memory. Sheer Agha, Head Keeper, and Marjan. "He is the animal that I love best." 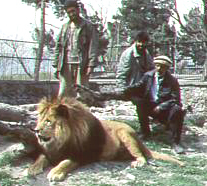 Now it seems Kabul wants to get a new lion or even a breeding pair. They see Marjan as a symbol, I saw him as a sentient being. If Marjan is to be a symbol, why not a symbol of freedom, a symbol of the end of captivity, the end of enslavement. For the first time in years, Samboo--Opal--Donatella the tortured bear has found relief. Her infected snout is still red from a knife wound inflicted by a Taliban commander who used to tease and beat her. She flinches when there's a loud noise--the result of hearing many bombings and prolonged gunfire. But thanks to international animal protection teams that arrived last week, the bear's wound is being treated with antibiotics. Her agonized bangings on the bars of her cage occur less frequently. She now stands firmly on her hind legs and looks at passersby with welcoming eyes. Because of your generosity, the Zoo Society recently sent $20,000 to sponsor a World Society for Protection of Animals (WSPA) animal rescue team that began arriving in Kabul on Jan 14. The remainder of that team should be in Kabul on Jan. 16. WSPA�s early reports N.C. Zoo�s Director, Dr. David Jones, have many positive aspects. 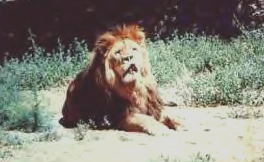 Marjan, the lion, seems to be in pretty good shape, especially given his age and all that he has been through. He is wobbly and thin, but his appetite is very good, and thanks to you all, he is now eating regularly and well. The WSPA�s workers initial impression is that Marjan�s stiffness is probably due to his age and the cold temperatures. (The Zoo Society is purchasing kerosene heaters that will be sent to Kabul very soon to rectify that problem.) The WSPA workers also suspect that Marjan may be blind, or partially blind, in both eyes, rather than just one, and that this blindness may be a key factor in his unsteadiness. Marjan sometimes stumbles when going into his nightquarters - probably because his vision is so poor. WSPA workers are installing a ramp to keep him from tripping over the threshold when he goes indoors. All of Marjan�s facial wounds appear to have healed and there is no indication they require any medical treatment. Thanks to you, Marjan�s life has turned around. Opal or Samboo or Donatella (We have not been able to confirm her name), the Asiatic Black Bear, has a significant wound on her nose. Abuse from the Taliban and other unkind people probably initiated the wound, she has inflamed by rubbing her nose against her cage. The WSPA team has already applied topical anti-inflammatory and antibiotic medications to her wounds and has set up barriers to protect her from further abuse from people. The team is watching Opal�/Samboo�s wounds carefully. If the wounds do not respond to the treatments currently underway, WSPA will use a mild sedative to calm Opal/Samboo enough to allow veterinarians to get close enough to apply additional treatments. WSPA is working hard to get Opal/Samboo/Donatello out of her cage into a larger, more appropriate one that will protect her from abuse and give her enough room to exercise. The Zoo Society just sent an additional $20,000 to WSPA to hire a welder to do the work that is necessary to move Opal/Samboo/Donatello to her new enclosure and to do other zoo repairs. That funding will also be used to purchase various equipment and supplies to improve the quality of life of the animals in the Kabul Zoo. The other animals at the zoo appear to be in good shape, and, thanks to you, have food and water. Kabul Zoo Staff The WSPA team confirmed that the Kabul Zoo�s keepers and staff were courageous and loyal in trying to care for the animals. Until the donations you provided arrived in Afghanistan, none of the keepers had been paid for more than six months. Yet, throughout those six months, the keepers continued to work part-time to provide what care they could for these animals. These keepers also begged, borrowed and did what ever they could to find food for the animals as well as for themselves and their families. The British Embassy told N.C. Zoo Director, Dr. David Jones, that the Kabul zookeepers are the only city employees who have been paid in the last six months. Your gifts gave these people their back salaries and reinstated them as full-time employees. The mayor of Kabul expresses his deepest gratitude for your generosity and compassion. Columbus Zoo Dr. Jones is communicating with the Deputy Director of the Columbus Ohio Zoo, who is scheduled to go into Kabul on Jan. 21. The Zoo Society is providing him with funding to buy kerosene heaters for the Kabul Zoo animals. He will also use Society funds to buy enrichment supplies that keepers can place in the animals� enclosures to give them things to play with and explore so that their lives will become more interesting. At long last, the animal victims of the conflict in Afghanistan are getting the help they so desperately need. A disaster relief team from the World Society for the Protection of Animals (WSPA), based in Massachusetts, arrived in Kabul this past weekend to begin its mission of mercy. The scope of this operation will be staggering. To start, WSPA's animal rescue team has entered the country with more than $10,000 of veterinary medicines to treat injuries and vaccinate animals against disease. Malnutrition, leg injuries and parasites are among the chief concerns for pack animals like donkeys and horses. Many Afghani residents rely on their donkeys, much the same way that Americans rely upon their automobiles. A sick donkey, unable to walk, can spell disaster for families who need to travel hundreds of miles for food and supplies. In their dispatches from the field, the rescuers estimate that the number of animals in distress could easily reach well in the thousands. The countryside around Kabul has been rocked not only by recent fighting, but also by a three-year drought that has decimated the animal population. Relief efforts are planned in rural areas as soon as aid workers can assure relatively safe passage. For the moment, land mines and civil unrest prohibit them from reaching remote areas. While WSPA is looking at the collective needs of animals in the region, the world's attention seems to be focused on one animal who has captured our hearts. 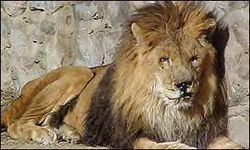 Footage of an emaciated, blind lion living at the Kabul Zoo has been broadcast in several countries, leaving animal lovers desperate for news of "MARJAN's" welfare. Marjan was blinded years ago when a grenade was thrown at him. He survived that attack, but like all the other zoo animals, is helpless to protect himself and has suffered greatly in recent years. "You look at him with those big open eye sockets, that smashed old jaw and matted fur. Your heart just goes out to him," explains WSPA International Projects Director John Walsh who is now coordinating relief efforts at the Kabul Zoo. "People want something done about it. And that's what WSPA is going to do." 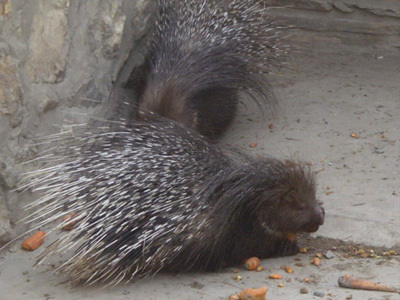 Since its arrival in Kabul, WSPA's animal rescue team has stabilized conditions for the animals at the zoo and is providing food, water and medicine. Marjan appears to be in relatively good condition now and is happily accepting his meals of fresh meat and clean water. WSPA is also talking with zookeepers about plans for improvements at the zoo and has paid the salaries of zoo employees who hadn't been compensated for several months. 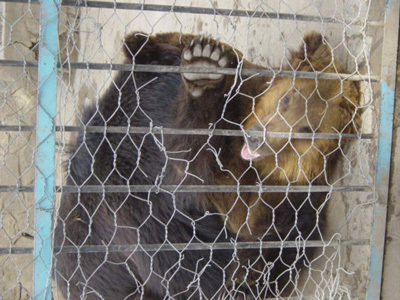 "While we would prefer not to see these animals living in a caged environment, our only option in this situation is to do our utmost to make the animals comfortable and to try to provide a more natural living space," WSPA USA Director Laura Salter said. "One of the greatest needs at the zoo is for enrichment activities to allow the animals to engage in natural behaviors such as climbing, swimming and playing. Fortunately, the American Zoological Association is providing funds and shipping in a cargo load of materials to enable us to provide just such an environment for the animals very soon. This will diminish the animals' stress levels and provide a healthier, more satisfying living environment for them on a long-term basis. " Outside of the zoo, suffering continues exponentially. An as yet unknown number of working donkeys and horses have developed serious health conditions due to a three-year drought, poverty and violence. "We are facing an entire population of working animals who are struggling to survive amidst malnutrition and drought. These animals have not received any veterinary care in a very long time, if ever." Salter explains. "In order to reach the greatest number of animals possible, WSPA is networking with various relief agencies and the government in Afghanistan. Partnership will play an essential role in getting aid to the animals in most desperate need." The Brooke Animal Hospital, based in England, has been helping the animals of Afghan refugees in Pakistan and is expected to contribute significantly to relief efforts for the working animals now returning to Afghanistan. 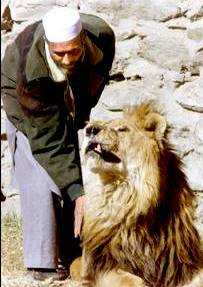 KABUL, Afghanistan -- Marjan, the blind and crippled lion, got his first dose of deworming medicine. 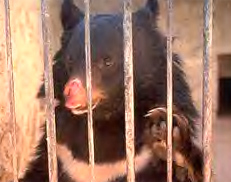 Samboo, the bear who was so terrified by recent bombings, ate apples smeared with antibiotics. Rescue teams are to leave for Kabul in a mission to save the animal victims of the Afghanistan conflict. 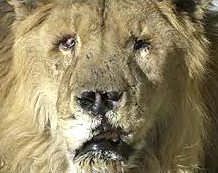 Marjon, a one-eyed lion, and a bear, who were both attacked by the Taliban in Kabul zoo, will receive help. Teams from the World Society for the Protection of Animals (WSPA) are due to leave for the city tomorrow. Ravaged by war, the Kabul Zoo is starting to receive food, medicine and veterinary care from other zoos, animal lovers and international agencies. After years of bullets and bombs, the Kabul Zoo in Afghanistan lies in ruins, its few remaining animals scarred by civil war and torment. The only elephant was killed by a rocket. 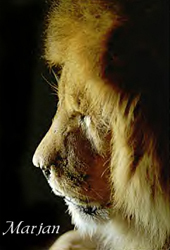 The sole lion has one eye; its other was lost in a grenade attack. 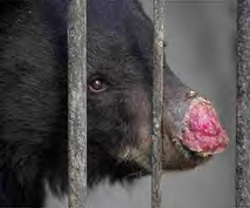 The Afghan bear has a blistering sore on its nose from a beating. The zoo grounds are a mess: The bars of the cages are twisted; fresh water and electricity are rare commodities; and medical treatment for the creatures is all but nonexistent. Things are finally looking a little brighter for the residents of the Kabul Zoo. Although the buildings and displays were ravaged by heavy artillery in 1992 and 1993--and many of the animals who weren't eaten for food were beaten with sticks and pelted with rocks by bored Taliban soldiers--19 of the original 37 species have survived, including monkeys, wolves, a bear and a 45-year-old one-eyed lion named Marjan. The big cat was blinded when an Afghan fighter threw a grenade at him in the early 1990s. "He is as old as I am," zoo director Sheragha Omar recently told the Associated Press. "The poor beast has no mate. He is aging fast. Mostly, he is traumatized from his brush with death. But we cannot let these animals die," continued Omar. "It is our Pashtun honor. We do not count up the cost. Our duty is to save them." Late last week, the UK-based World Society for the Protection of Animals (WSPA) was able to get funds directly to the zoo via a British newspaper. The money will provide ongoing veterinary care and food for the zoo's animals for the next three months. WSPA is also preparing to mobilize an animal-disaster relief team to visit the country at the earliest opportunity.